One of the great things about having your own blog, is that you can create a little platform over time – for free — to broadcast your opinion to the world. The question of course, is getting someone to listen. For every post where you might go off on a random topic (such as Japanese toilets), you need to work really hard to provide value to your readers, such as providing them a detailed, real-life case study of how to work remotely in a foreign country. Contrast that with a Super Bowl commercial. With a cost of $4 million dollars for a 30 second ad and a reach of 100 million people, a lot more is at stake. All eyes are on you, and you will be judged in the court of people’s opinion. But now add a new twist. With Twitter now fully grown up – it turns 7 in March – no longer can ad creatives submit their final commercial to the network, then kick back during the game with some nachos and enjoy their work. A Nielsen study revealed that a third of people using Twitter are tweeting about content they’re watching. Millions of people will be monitoring, commenting, criticizing, and praising brands on the fly via Twitter during the game. CNBC reported that nearly half of the commercials included Twitter hashtags. Some are merely suggestions, aimed to coordinate tweets around their spot. For example, #NoDrama for Cars.com or BudLight #HereWeGo. These feel like basic branding messages, and ways for the brands to determine how many people were engaged in the campaign. The more ambitious step is tying it into an overall campaign, and using it as a call to action. This would include Toyota’s #wishgranted, which was used as a contest in the weeks before the Super Bowl, allowing fans to get into the TV spot, and Hyundai’s #pickyourteam, which allows you to win tickets to next year’s game. Marketingland.com did a great job of tabulating brand use of Twitter hashtags during the Super Bowl. Pick the Hashtag that is the most obvious. Go ahead and ask 100 people what the Hashtag for the Super Bowl should be. My guess is 95% would say #SuperBowl. 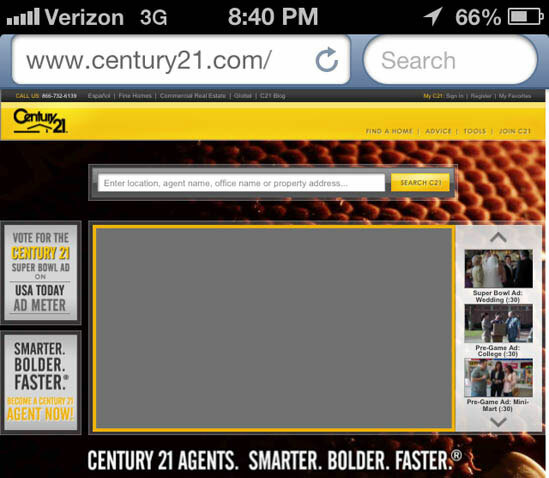 This is trying to bring it to the next level, where fans actually get to influence the outcome of the ad. This was done by Coke, who sent people to the web to determine whether cowboys, Mad Max warriors, or showgirls would get to a Coke bottle first. In the end, none of them did for me. Everyone at my party brought up CokeChase.com on our phones, but the website was down and couldn’t handle the traffic. The problem with realtime action, is sending everyone to one website at once – reports have it at 1.3 million people. While there are ways to test the server load and prepare for this, much like the blackout at the SuperDome, chaos can ensue when circuits get overloaded. 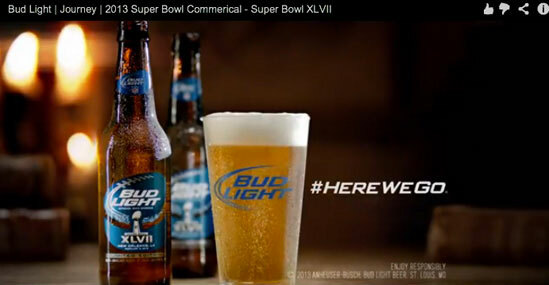 HighScalability.com: Super Bowl Advertisers Ready for the Traffic? Nope..It’s Lights Out. This is what I want to emphasize today. The Oreo graphic was “designed, captioned and approved within minutes,” according to Sarah Hofstetter, president of the cookie brand’s digital agency, 360i. All the decisions were made in real time quickly because marketers and agency members were sitting together at a “mission control” center, or a social-media war room of sorts… Among those who were there were two brand team members from Oreo, and nearly a dozen creatives, strategists, community managers and social-media listeners. The tweet was retweeted 10,000 times within one hour. WHY WAS THIS THE EXCEPTION? I’ve been using this as a case study since 2010, when I had my intern set up in a war room monitoring tweets during Wired’s SXSW event. Isn’t this what comedians have done for years? For example, I know when Jimmy Kimmel was hosting the Emmy, he brought in Adam Carolla and some other fast-on-their-feet comedians to be able to write jokes during the show. If Ben Affleck said something weird, or Anne Hathaway has a crazy dress, they can quick feed Jimmy a joke for the next time he comes back on stage. Anyone could come up with a quirky comeback about the incident and throw up the #blackout hashtag, but as we saw, a talented designer at the ready can take existing branding and whip out a decent original image in minutes. 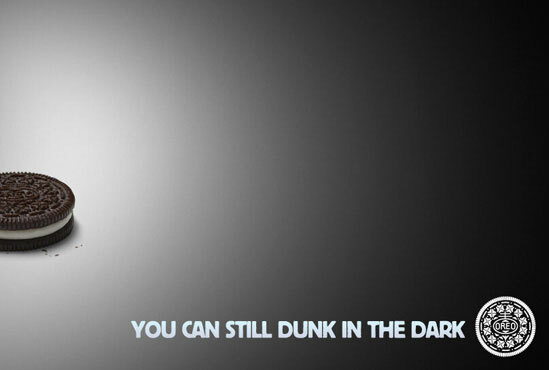 Oreo also was the only brand to have an Instagram campaign. While they went from 2,200 followers to more than 30,000, it will be interesting to see if they can capitalize on that. Maybe they should have put their URL up on the screen. This is something that can’t be run up the flag pole for approval. They had all the decision makers in the room. It sounds like Oreo had 15-20 people in the room. While that seems excessive, for something of this magnitude, it makes sense. For future events, I can see brands bringing in a small team of writers, artists, and specialists just for this purpose. Budweiser Black Crown? Beck’s Sapphire? Are we done with these crazy beers? Listen, a beer is a beer. We’ve got your basic beer, we’ve got light beer, and we’ve got stuff like Guinness or Oatmeal Stout. We don’t need made up marketing beers. This is beginning to feel like the “clear gravy” trend of the 80s. Well done, Sketchers. I’m still going to trust my running shoes to Nike or Asics, but at least you made a great commercial. Last year having Joe Montana lamely shilling Shape-Ups was pathetic. In my former Super Bowl posts, I always gave huge ratings to GoDaddy, for their ability to create buzz, and be the most effective direct marketer during the game. Someone is always talking about them. You always know what their URL is. You always know what their product is. So while they got a lot of attention for “The Kiss,” it won’t surprise listeners that I loved their spot for “YourBigIdea.co.” (The wicked Boston accents didn’t hurt). In that spot, they show exactly why everyone needs to register their URL today and not wait, because someone, somewhere around the world is ready to steal it. If you find yourself in that situation, go to my website, GetYourNameToday.com to take my free, 7 minute tutorial to register your website. 2011 – Getting Facebook status updates in your car is a ridiculous idea. Or is it? Yesterday was the last day of professional football, or as they say in my house, the start of productivity season. See, as an entrepreneur I often do some work on my business 7 days a week. But during football season, you can find me in front of my TV for hours on end on Sunday. But from now until September, I get that day back. Even if I just use it to rest or learn new skills, that’s a great increase in productivity. Kind of like using Freshbooks to do your billing. It just frees up more time to be more productive. This entry was posted on Monday, February 4th, 2013 at 9:53 pm and is filed under Branding / Advertising, Marketing Case Studies, Pop Culture / Entertainment, Social Networking / New Media, Twitter. You can follow any responses to this entry through the RSS 2.0 feed. Both comments and pings are currently closed.